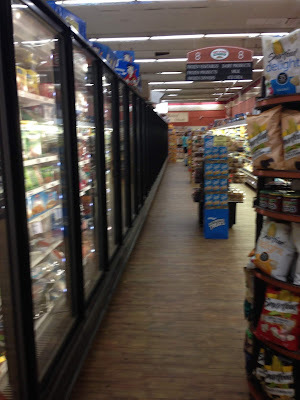 We're coming back to the Key Food Marketplace of Beacon, NY for a real store tour. Let's begin with some history here. The supermarket was built at some point prior to 1965 (Historic Aerials doesn't go back farther than that here), and my guess would be in the 50s, as a Grand Union. GU had a significant presence in the Hudson Valley and while quite a few of the stores have closed for good, many of them were purchased by Tops (such as Tannersville), Hannaford (Kingston, Pawling), or Key Food operators. Others became Grand Union Family Markets run by C&S (Saugerties). I can't seem to find the previous owner's name right now, but he owned several other stores as well. If I'm not mistaken, he currently owns only one store. Junior Dabashi, whose family also owns supermarkets in New York City, bought this store, the Mahopac location (now demolished for a new Stop & Shop), and the Milford, PA location from the same previous owner, although he purchased Mahopac and Beacon in 2008 and Milford slightly later, I believe around 2015. Dabashi had redone the facade of this store when he took it over, and at the time of my visit, was in the process of remodeling the interior as well. Because of the property layout, this has the unfortunate result that the outgoing store fixtures were near the garbage which is just next to the entrance. I do prefer the crate look to the table look, as seen here. The store is quite small, and the first aisle consists of produce and deli in the front corner next to the entrance. We can see some Grand Union-era wood paneling behind the deli here, although it actually works quite nicely with the new produce displays. The manager's office is tucked away behind the deli here, it looks like. I don't know for sure, but I would guess that this deli sign was installed by Key Food, not Grand Union. Back of the first aisle. We can see the newly-installed wood look flooring here, which is now across the entire store. At the time of my visit, it had only been installed in certain sections. Aisle 3, which is really the second aisle (the produce aisle is labeled as two aisles), had not received new flooring. Looking back at the first aisle, it appears that Grand Union would actually have had it as two separate aisles. Frozen and dairy in the last aisle. We can see the freezer cases are all brand-new, and the new flooring reaches this aisle as well. The dairy cases had not been replaced at the time of my visit. Looking towards the back of the store. In the front corner there is an alcove with baked goods (the store, as it is extremely small, does not have an in-store bakery). Google Maps estimates that the store is approximately 15,000 square feet with just 10,000 square feet of sales floor space. That's quite small for the suburbs! Also in the front corner is a display of Bob's Red Mill, with a picture of store owner Junior Dabashi with Bob! Gotta love those personal touches!